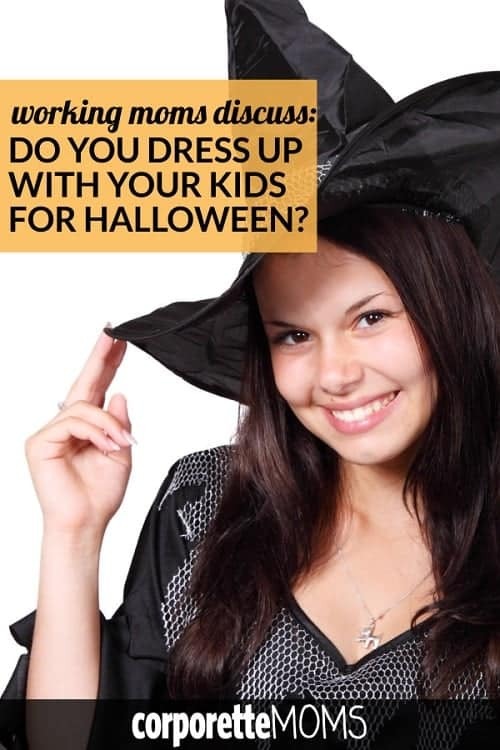 Working Moms Answer: Do You Dress Up With Your Kids for Halloween? For my $.02, I’ve had some years where I tried to get dressed up with the kids — the year J was Kylo Ren and H was Yoda I tried to do the Princess Leia buns, but decided to attempted to go with what I said was a General Organa costume instead (black moto leggings and a black camp shirt with combat boots)… so… mixed metaphors and nothing turned out great. (Pro tip: if you’re trying for the Princess Leia buns, use one of those foam donuts or a rolled sock — I normally avoid because I’ve got enough hair that using a bun helper like that looks ridiculous on me, but I definitely needed more volume!) I’ve also donned a witch hat for opening the door sometimes. BUT: this year I’m not planning on dressing up at all because I’ve noticed that most moms I know don’t — so it’s one less thing for me to worry about. How about you guys — have you ever or would you dress up with your kids for Halloween? What does your Halloween night look like? Do you decorate your home for Halloween with talking eyeballs and things like that? 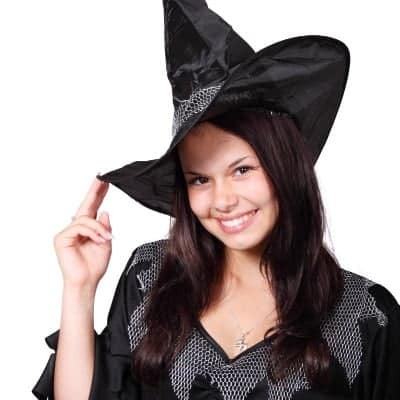 Do you have Halloween parties to go to with coworkers, parents, friends over the next few weekends? Pictured: stock image via Stencil. Psst: If you like participating in the Teal Pumpkin Project (offering non-candy treats to kids with allergies), but don’t feel like spray painting a pumpkin teal every year, do note that Target has faux teal pumpkins that are apparently carvable. Halloween is my favorite holiday. I host a party every year and decorate inside and out. Trick-or-treating is a huge deal in my neighborhood. Some years my costume matches my son’s, but this year it doesn’t. He’s Black Panther and I’m Sansa Stark. Can’t wait! So my family cosplays at Comic-cons, and we usually do a theme. When our daughter was a baby, we did Ghostbusters II (DH was Vigo, I was the ghost-nanny, and DD was baby Oscar). This year we’re doing Lord of the Rings – DH is the Witch King, I am Eowyn, and DD will be a hobbit. At least I am hoping she will wear her hobbit costume to the Con rather than her Halloween princess costume. Some years we dress up with her for Halloween, some we don’t. Halloween has always been one of my favorite holidays, but sometimes I don’t have time for a real costume for me. As a toddler she was a bumblebee, so I just wore my beekeeping suit while trick-or-treating. Last year she was a dinosaur, and I copied a suggestion from the main page on business-appropriate Wonder Woman. I just wanted to say that I love that you just happen to have a bee keeper suit. I don’t but now I wish I could dress up both my kids as bees and get one! This is only my second Halloween as a mom and last year I was too pregnant with no. 2 to want to do anything much but I love the idea of everyone dressing up. My daughter is too opinionated though so I am not sure what we’ll ever all agree on. When my son was 6 months, we dressed him in a red-striped onesie as “Toby” and my husband went as Jareth the Goblin King from Labyrinth. It was hilarious and very fun.